Looking for a fun and educational read for your end-of-summer reading list? I suggest you add King Alfred's English to your reading to-do list! It's not often that I get to do a product review that is just for me! I could share this with the kids, and I probably will as they get older, but when it was offered that it could be just for me, I jumped at the chance. Have you ever wondered about our English language? How things came to be and why they are the way they are? Why do we sometimes say X-mass instead of Christmas? Where did the word 'berserk' come from? And why do we use "pn" for words like pneumonia instead of just "n"? This historical read is both captivating and entertaining. It is written kind of like a lecture between friends over dinner and drinks. It is unique because it covers history from a language point of view from about 55 BC to close to present time (relatively speaking). While learning about events and people, you are also learning little tidbits about "why" English is the way it is. It is Christian-based, but not so much that my non-Christian readers will be rolling their eyes. My favorite part of the book was the end section titled "If only King Alfred could see us now!" In Western PA I hear a lot of double negatives, something that I hadn't really noticed before. There's a section on double negatives, as well as a section outlining how languages develop and become easier to use. The prediction that English is becoming easier to use was no surprise to me; I have often thought that people are using far fewer words to express themselves than my grandmother's generation used. The fact that this was affirmed in this text was a confirmation of this for me. 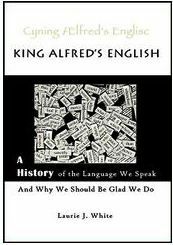 King Alfred's English can be purchased through The Shorter Word.com for $16.95 for a physical product, or $5.95 for a Kindle version. Not completely convinced you want to check it out? Many other crew members reviewed this text as well. Click here to check out their reviews, or click the logo below. Disclaimer: as a member of The Schoolhouse Review Crew, I received the Kindle version of King Alfred's English free of charge in exchange for an honest review on my blog. I received no other compensation. This book is right up my alley! One of my favorite classes in college was linguistic anthropology, which is exactly what this book is. I am adding it to my wish list!